Our Little Ed’s Nursery was not undeterred by the rain at the beginning of term thanks to a very special visitor. 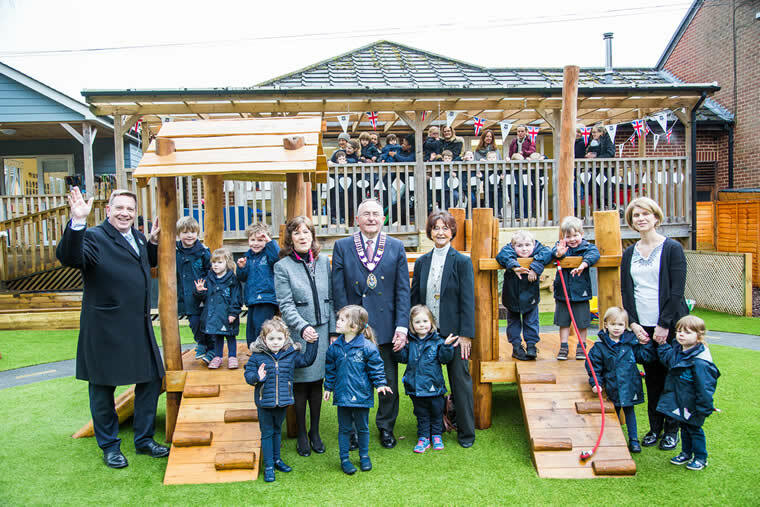 Along with the Headmaster and our Chair of Governors Jackie Alliss, Mayor Malcolm Carter joined everyone to help them officially open the Little Ed’s brand new Sensory Garden. Months in the making, the team at Little Ed’s are delighted with their new outside play area and the fun and exciting opportunities it provides. Karen Bailey, Nursery Manager commented, “I was really keen to have a free-flow design where the children could choose how and where to play in their garden and make independent choices on how to use the areas and equipment. It was also important to create a space to allow for physical, sensory play, role play, construction and mark making and the designers have certainly ticked all of the boxes”.